Beijing: China on Wednesday indirectly cautioned India against intervening in the Maldives, saying any outside "interference" in the country's political crisis would "complicate" the situation - a day after the exiled former President Mohamed Nasheed sought India's military help.China also denied allegations that Maldivian President Abdullah Yameen had its backing and said Beijing follows the principles of non-interference in other countries' domestic affairs. "The current situation in the Maldives is its internal affair. It should be properly resolved through dialogue and consultation by relevant parties," Chinese Foreign Ministry spokesperson Geng Shuang said. "The international community should play a constructive role based on the (principle of) respecting the sovereignty of the Maldives instead of taking actions that may complicate the current situation," Geng said. On Tuesday, former Maldivian President Mohamed Nasheed, who was ousted in a coup in 2012 and is close to India, asked New Delhi to intervene militarily in the Maldives.India in a strongly-worded statement said it was disturbed over the state of Emergency imposed by President Abdullah Yameen whose government has arrested the country's Chief Justice and former Maldivian President Abdul Gayoom. 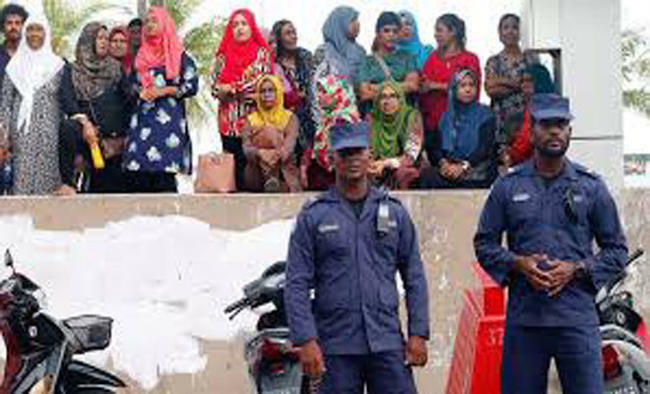 Last week, the apex court had ordered the release of nine parliamentarians which could have restored the majority of the Maldivian Democratic Party-led by Nasheed and threatened Yameen's Presidency. To calls by the international community for the Maldives government to comply with the apex court's ruling, Geng said: "We believe that the Maldives' government, political parties and the people have the wisdom to address the situation independently." "We hope the relevant parties in the Maldives will resolve the issues through consultation and restore the national stability and social order as soon as possible." Asked about former Maldives Parliament Speaker Abdullah Shahid alleging that Yameen was backed by China for approving a pro-Beijing trade pact, Geng said: "I have just said that the current situation in the Maldives is its internal affair. China always follows the principles of non-interference in other countries' internal affairs." "China maintains friendly cooperation with the Maldives including the FTA which serves the common interests of the two countries. The facts have proven that after signing of the FTA cooperation has benefited the two peoples," he added.China has invested heavily in the infrastructure and booming tourism sector in the Indian Ocean nation. In 2017, Maldives became the second country after Pakistan to sign a free trade agreement with China. The Yameen government had rushed through the FTA pact in the country's Parliament, triggering concerns in the opposition party and in India. China's growing closeness to the Maldives under Yameen is seen as part of Beijing's strategic encirclement of India, and eroding New Delhi's influence with Male.Yameen also approved China's Belt and Road project, a network of highways, railways, sea lanes and ports that aims to connect Asia, Africa and Europe.